I love the cooler weather and the beautiful colours that Autumn brings! And I’m so pleased that it’s almost Winter! Our little corner of the world has some amazing seasonal colour when the weather changes. And if you can choose the right kind of day, nothing rivals the light in an Autumn sunset. With this is mind, I organised my favourite model, my favourite photographer, and my favourite pieces from the Molly and Mama Autumn collection, for a stunning photo shoot. We headed up to our local arboretum to capture some images. The weather was glorious, and the light was perfect! It all came together beautifully! 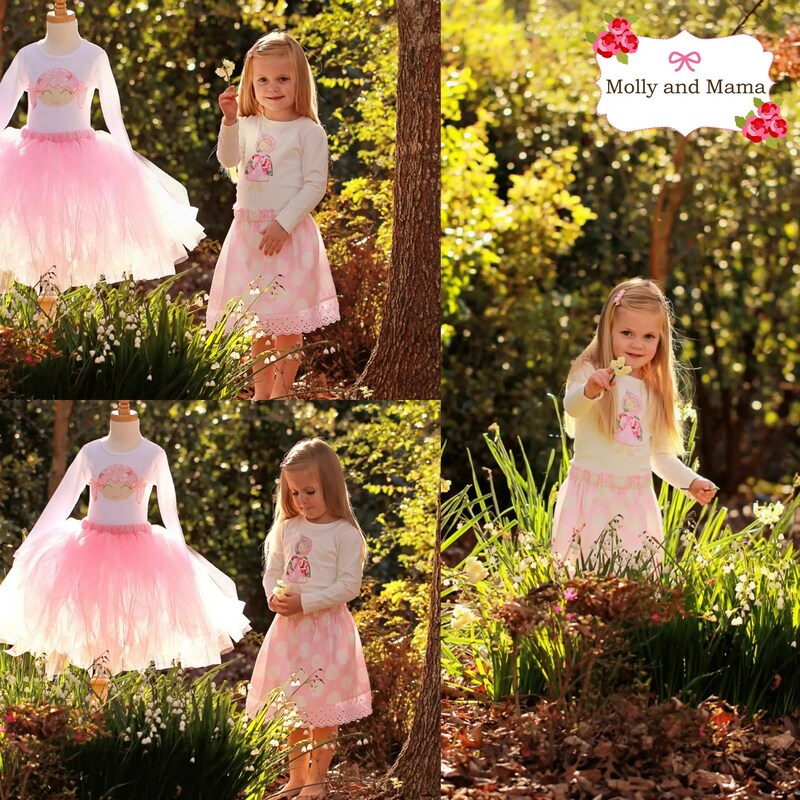 I loved making all of these pieces; from tutus to tees, clips to capes, bonnets, skirts and more. 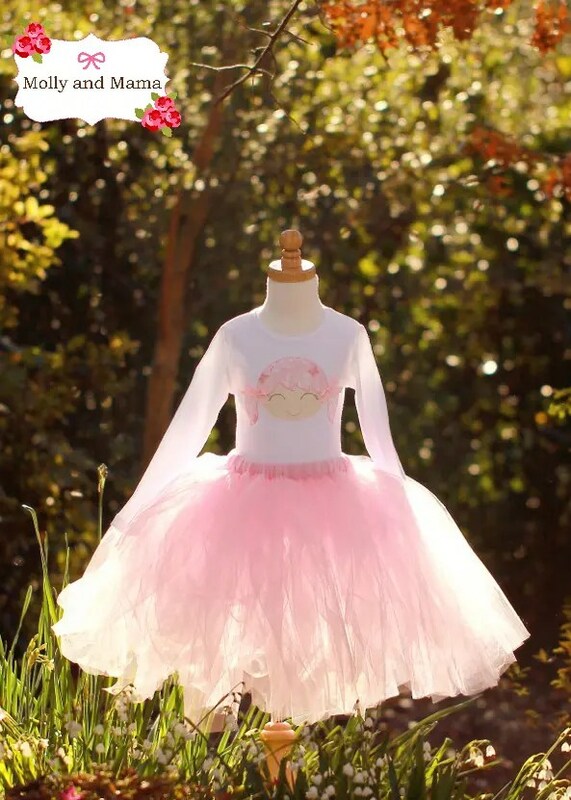 The tutus are so whimsical and very simple to make. I’m hoping to do a tutorial for them soon. 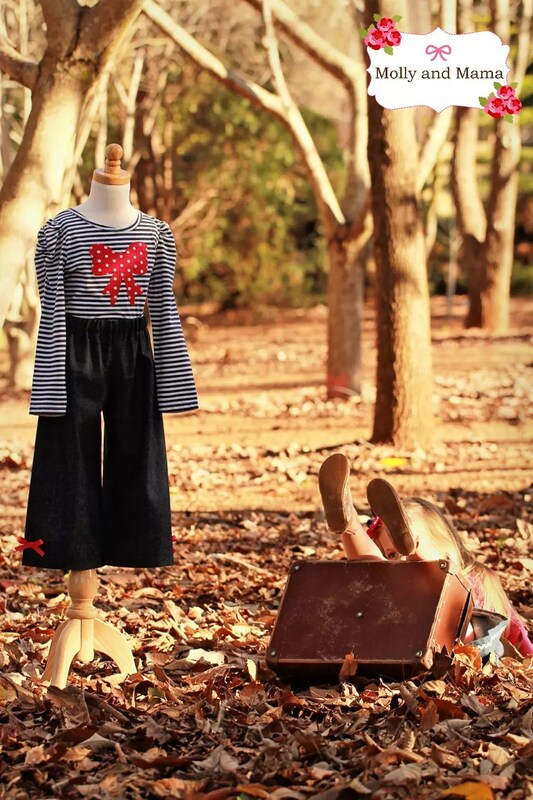 The polka dot skirt was created with super soft baby-wale cord. And naturally, I adorn everything I can with ribbons or lace (hence the pretty trim). The sweet face on this t-shirt was created with the ‘Doll Face’ applique template which you can purchase as an instant download HERE. 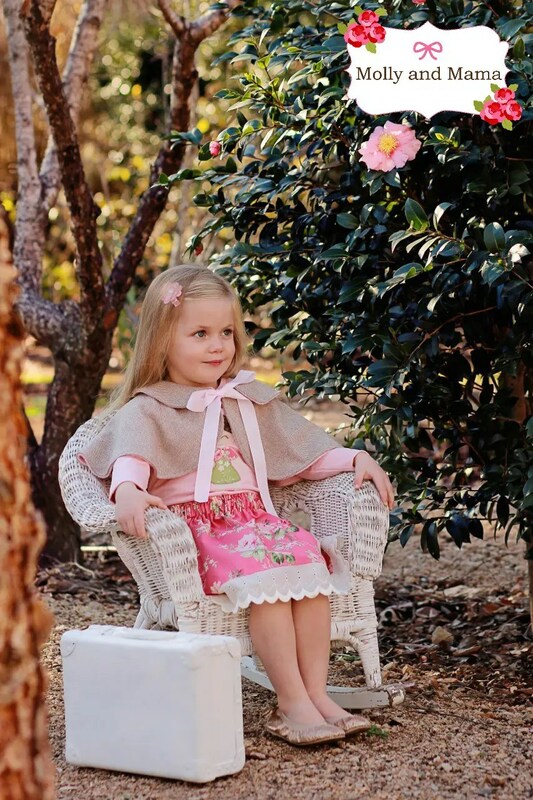 This pretty cape would be perfect in red, but I had to be true to my pastel obsession and use a beautiful pink floral. 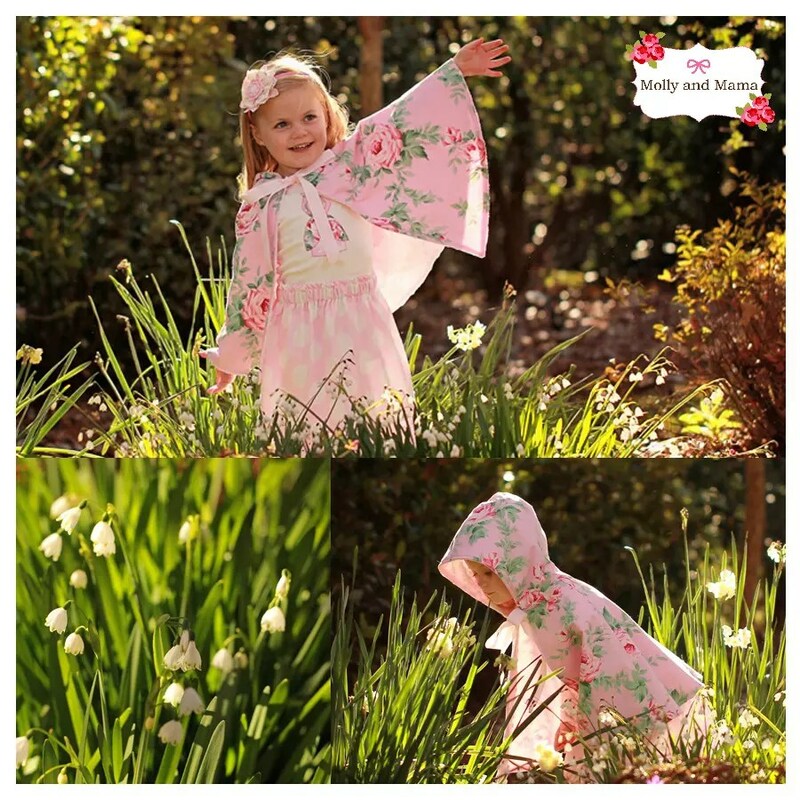 Lined with pale pink minky fabric, it’s warm and snuggly. But not too heavy! More pink floral, more lace, more bows. What could be prettier? This flannel-lined bonnet was very easy to whip up and such a dainty alternative to a beanie! One of my favourite pieces to sew for this season was the pretty wool capelet. Lined with soft pink minky, it was surprisingly warm. The 100% wool suiting used for the outer was simple to sew and draped beautifully! I also had a bit of fun with brights. Hot pink and navy blue make a wonderful colour combination. Wide leg denim pants are perfect for playful ladies. I loved adding the tiny pink bows for that added touch of fun! I made all the hair accessories too. The large rosettes were created with fabric Yo Yo’s. You can learn to make your own HERE. 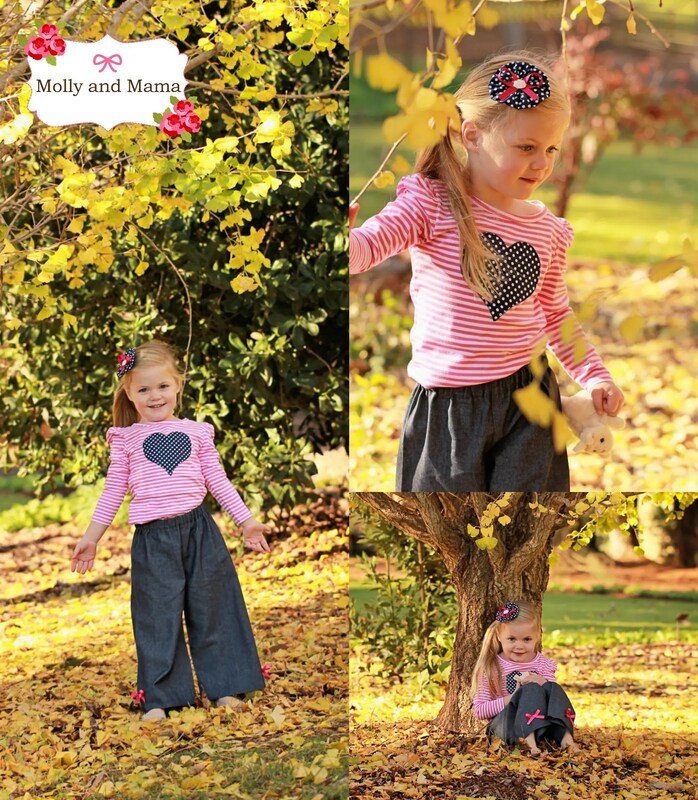 The cute polka-dot heart on this candy striped tee was made using the same free template used in the HEART APPLIQUE TUTORIAL. More denim, navy and hot pink! You can pick up the pattern for this Betty Babushka applique template HERE. A white ric rac trim on the denim skirt really adds some interest too. 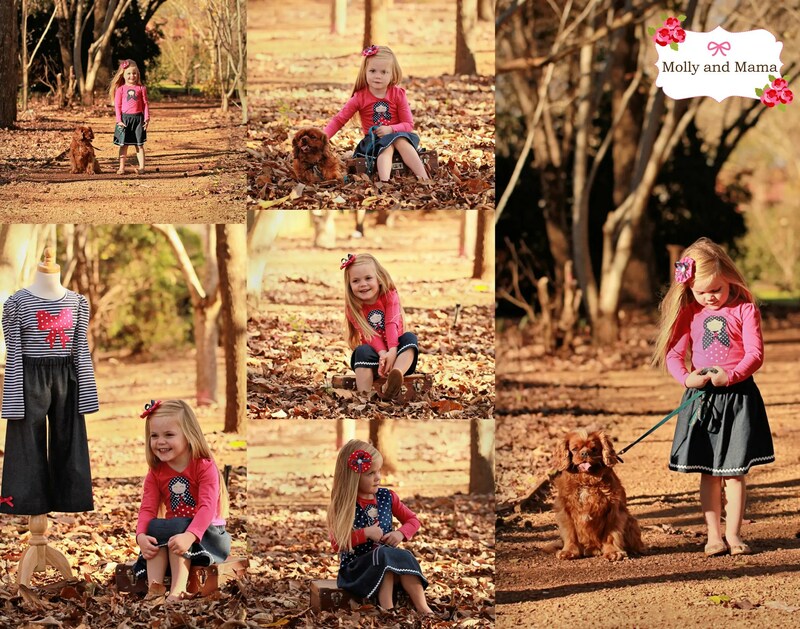 Our little model had a lot of fun taking the gorgeous Tilly for a stroll. She found it more difficult when being asked to sit still though! Hence, the cute little ‘out-take’ here. I just had to show it to you. Just to let you know that not everything always goes to plan! A big thanks to Melissa from MiaMia Photography for the exquisite images. Our models Chloe and Tilly had a ball! What do you love sewing for the cooler months? 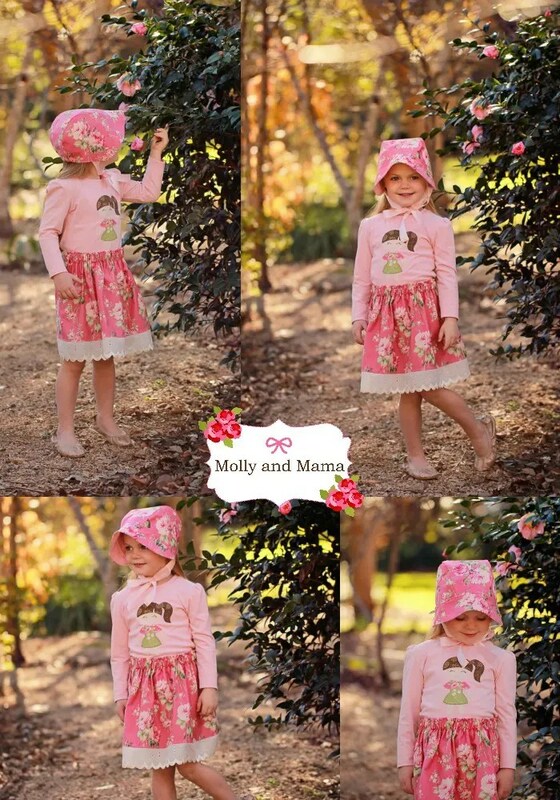 I’d love for you to share on the Molly and Mama Facebook Page. Don’t forget to hit LIKE to keep up to date with our seasonal collection releases. Or leave a comment here. I really enjoy hearing from my readers! Thanks for your lovely comments Maegen! The capes were a lot of fun to make!